It's that time of year again. Time for fun decorations, costumes, and lot's of sweet goodies. If you are like me, the goodies and treat's are the best part of this spooky holiday. However, it would be nice to find some yummy treat's that aren't scary unhealthy for you. This is where Bitsy's Brainfoods comes in. These cookies are filled with nothing but healthiness but taste as sweet as those "other" treats you will find in you child's trick or treat bag. Made in a nut free facility - school safe! While I couldn't taste these myself, I had some little friends taste them for me. I was told they were "very yummy" and I was asked, "Can I have some more cookies please?" Not only are these little babies made with ORGANIC and Non-GMO fruit and veggies, they are also NUT FREE. I think its great that they are nut free, making them school safe. I work with kids often so I know how important it is that the snacks they bring to school are also safe for their friends. 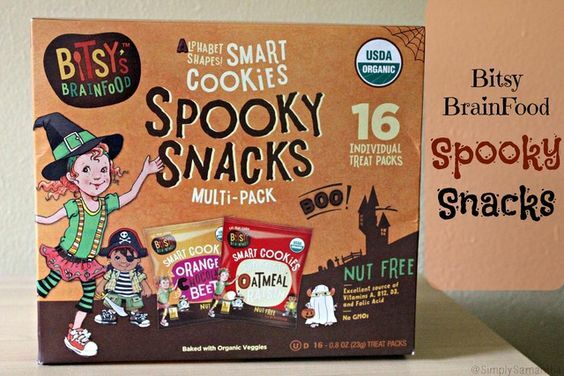 If you are looking for some great last minuet treats for your little one's this Halloween season, pick some up at your local Target or Wegmans! And don't forget your $1 off coupon! Learn more about Bitsy BrainFood. *Disclosure* Bitsy Brainfood sent me this package in exchange for a review.